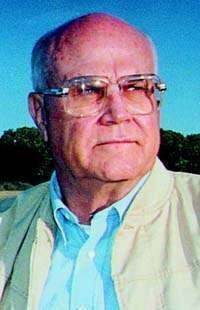 He walked a cop's beat, wrote state law and left an enormous legacy to park and wildlife resources as director of the Nebraska Game and Parks Commission. He was the first one in the office every day, expected results from his employees and ran a ship so tight that some feared him. But without question, Gene Mahoney's greatest skill was getting people to give huge sums of money to public projects in Nebraska. "Everybody knew when Gene called and said he'd like to come down and have lunch with you, he was up to no good," Lee Simmons, director of Henry Doorly Zoo, said about the man who for 16 years raised money for the zoo's most ambitious projects. "But still, they'd have lunch with him." Mahoney died at 1:36 a.m. Thursday at Bergan Mercy Hospital in Omaha, where he was recovering from a long illness. He was 76. The lifelong resident of south Omaha is survived by a brother and two sisters. His funeral is scheduled to begin at 10 a.m. Monday at St. Mary Catholic Church in Omaha. Gov. Mike Johanns ordered flags flown at half-staff Monday in Mahoney's honor. "Fortunately for Nebraska, Gene focused his talents on the betterment of our state," the governor said Thursday. "For that, we are eternally grateful." Mahoney accomplished much but will be most remembered for turning Nebraska's state parks from a neglected, struggling system into financially sound tourism destinations that rival those found anywhere in the nation. Under his directorship from 1976 to 1988, the commission restored its state park system, including such premier sites as Fort Robinson, Arbor Lodge, Rock Creek Station and Fort Atkinson. Mahoney also led development of Arthur Bowring Sandhills Ranch, Ashfall State Historical Park and Platte River State Park. Finally, he oversaw development of the state's flagship park near Ashland, Eugene T. Mahoney State Park. He did it by securing legislative solutions to funding shortfalls and using impressive powers of persuasion to solicit donations from Nebraska's wealthiest residents. "Gene was a builder," said Rex Amack, who succeeded Mahoney at the commission in 1988. "Not only brick and mortar, but the landscape." Eugene Thomas Mahoney was born on March 27, 1928, in Chicago. One of six children of a construction worker, he moved to Omaha with his family while a young boy. In 1949, he joined the Omaha Police Department and was assigned walking beats downtown and in southside neighborhoods. He achieved the rank of sergeant and led a vice squad before resigning from the department in 1961 to become a state senator. He joined the Legislature not through election but by a controversial appointment. While Gov. Frank Morrison attended a conference in Hawaii, Lt. Gov. Dwight Burney appointed Mahoney to the position to fill a vacancy. The former vice cop was not one of the governor's three choices. Regardless, Mahoney easily won his first election, in 1962, and Omaha voters would re-elect him three times. During his tenure, he changed his political affiliation from Republican to Democrat and became chairman of the Executive Board, one of the most powerful positions in the Legislature. On July 16, 1976, the Game and Parks Board of Commissioners appointed Mahoney as the new director. Although Mahoney had been a lifelong hunter, his appointment prompted criticism from those who thought he lacked the scientific background to lead the agency. Mahoney called the criticism "brutal and unfair" and went on to say that ensuring professional staff had the financial resources to do their jobs was his main responsibility. "The name of the game is funding,"he said in a Lincoln Star article. He immediately recognized that while fisheries and wildlife programs had reliable funding sources, the parks division did not. He used his statehouse connections to persuade lawmakers to enact a park-entry permit and devote a portion of cigarette tax revenue to building park roads. Under his leadership, parks added such services as rental cabins, the fees of which helped support the system. The programs raised millions of dollars annually. When Mahoney joined the agency, about 80 percent of parks funding came from general tax revenue. Now, 80 percent comes from fees or funds devoted to the parks and only 20 percent comes from state taxes, Amack said. From 1976 to 1988, annual park visits grew by about 2 million. Mahoney used another tool to overcome budget gaps: the well-placed phone call to Nebraska's rich and powerful business leaders. He successfully tapped wealthy individuals, foundations and corporations for millions. "Gene was all about people," Amack said. "He never used and probably never heard the word 'networking,' but he invented it." His skills as a fund-raiser were most brilliant when it came to developing the park that bears his name. Of the $12 million spent on Mahoney State Park, some 85 percent of it was raised by Mahoney himself, Amack said. While he charmed benefactors, he sometimes intimidated his own staff. Mahoney, who was never married, devoted his life to his work and at times seemed to expect the same from those under him. "He would not tolerate challenges to his authority as director," said Bill Bailey of Lincoln, the assistant director in charge of fisheries and wildlife under Mahoney. "He expected loyalty to the commission and the work we were trying to accomplish." Bailey, who retired from the agency in 1993, said that while Mahoney could be tough, he also stood up for what was right for the resources. And he would hear you out. "I always got an answer one way or another," Bailey said. "I always respected that. He could make a decision. I may not always agree with it, but he could make a decision." In news stories, Mahoney often deflected praise for the agency's accomplishments, saying the credit belonged to the staff. And while employees used the phrase "couch session" to describe a chewing out in Mahoney's office, he also would offer them praise. "He could dish it out both ways," said Dale Bree, assistant director in charge of parks, 1974-94. Mahoney had the reputation of being mostly interested in parks, but fisheries and wildlife fared well under his tenure. Early in the Mahoney era, the commission launched its habitat stamp program for wildlife land acquisition. He also championed funding efforts for fish hatcheries and reintroductions of Canada geese and wild turkeys to specific areas in the state. He would say he was proudest of Nebraska being the first state in the nation to require steel shot for duck hunters, which has reduced lead poisoning of waterfowl. "If he believed in a cause, he found a way to get it done," said Janice Spicha of Lincoln, president of the Nebraska Council of Sportsman's Clubs. P. Joe Gabig of Lincoln, a waterfowl specialist who joined the commission two years after Mahoney, offered an anecdote that revealed the director's complexity. The commission had committed to releasing Canada geese in the North Platte Valley. To pursue funds for breeding pens, Gabig sent a memo to another department administrator. Upon learning about the memo, Mahoney reprimanded Gabig for not communicating to his supervisor - a violation of the chain of command. But then Mahoney got on the phone, and within one day he secured a $60,000 donation to pay for the pens. "I was impressed," said Gabig, who resigned from the agency several years ago. After a dozen years at the helm, Mahoney told commissioners in 1988 he would not accept another term. "After the job of governor, it is the second-most toughest job in the state," Mahoney said in announcing the decision. After 12 years in a high-profile position, Mahoney accepted a behind-the-scenes job as director of the Omaha Zoo Foundation. The foundation paid him $1 annually, which he always refunded, said the zoo director, Simmons. In 16 years, Mahoney helped raise more than $100 million for the zoo's attractions and endowment, Simmons said. "He had really incredible people skills, and he knew everybody," Simmons said. While his skill as a fund raiser will be sorely missed, so will his sage advice. "Gene was a friend," Simmons said. "The big thing we're going to miss was the fact that he was a good friend."